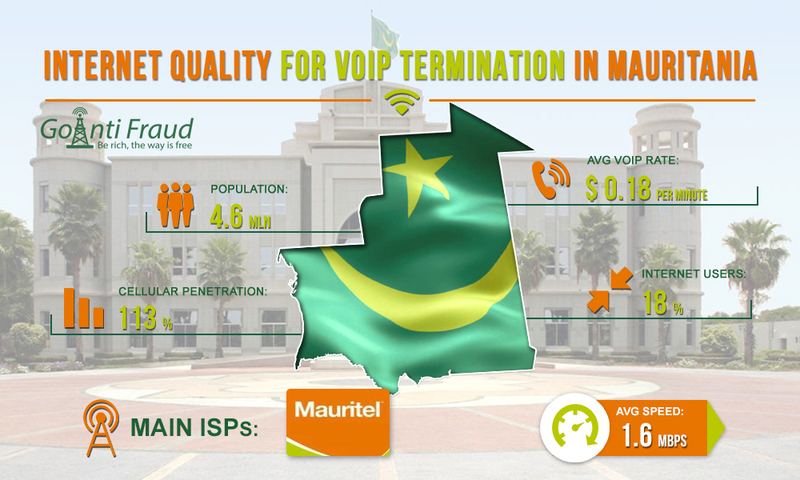 Small population compared to other African countries and the low level of economic development curb the growth of telecommunications market in Mauritania. Nevertheless, the government is making efforts to develop the Internet services sector by improving the baseline network and connecting to international cables. Let's find out the current state of the Internet market and whether the Internet is suitable for making money on termination in Mauritania. Despite all the efforts of the government, the telecommunications company Mauritel still retains a de-facto monopoly in the fixed-line segment. The new marking players lack motivation. Therefore, the broadband penetration is very low in the country - about 18% (0.86 million connections). Most of the Internet connections are via LTE networks. As we have already mentioned, the mobile Internet is not suitable for termination. In addition, the monopoly negatively affects the pricing of services. The main Internet service provider is Mauritel. The average data transfer rate is 1.6 Mbit and this is a very low rate for termination. For uninterrupted operation of the voip phone system hardware, you need about 5 Mbps. Despite the low average rate for the country, you can still connect the Mauritel ADSL Internet at speeds of up to 12 Mbps. But not all areas have a good signal; the regulator often fines the local service providers for poor-quality service. Therefore, we recommend checking in advance, whether the coverage is good in the area where you plan to accommodate your equipment.